It’s still uncomfortably early when we debike and hit some blessed calm at Kbal Spean, the River of a Thousand Lingas. The mile-long path to the top of the hill has been swept clean as a village yard, and cheeutal roots form an elegant latticework, almost like natural stairs. Ascents of grey, slabby rocks feel almost landscaped, and looping vines create natural swings and hammocks. Z is in his element. I am in the throes of wondering at the marvels of travel and the joy of life — more specifically, I am pointing out a promising Tarzan vine — when my flip-flopped foot meets a rock and it all goes a bit Keystone Kops. My toe opens up. Blood squelches in the sole of my impractical footwear and sullies the pristine sand. Z swings as if at a playground. Having been fending off child labour all morning — it is still only 8am — it seems, well, worse than childish to make a fuss of a stubbed toe. I start to walk. It hurts. My foot slides around in my shoe. Obviously, I have brought nothing so practical as plasters, or even loo-roll. But I do, thanks to the children, have a nylon Khmer scarf (krohom). I try to rip off an end to improvise a bandage. The nylon border is remarkably resilient. He looks at me as though I am mad, but fetches his hatchet. We saw off the end. I tie it tightly. The bleeding slows and the padding means it no longer hurts to walk. It is only later that I realise what has confused him. I have squandered a valuable piece of cloth on a centimetre-long cut which would have stopped bleeding in a matter of minutes. Shortly afterwards, Z decides he needs a poo. It is a moment of almost unutterable glamour, only capped when a guy from Shanghai stops to offer me “clean cotton for your foot”. I look at the surgical mask in its plastic, his sparkling white T-shirt, and the filty red and white fringed check around my almost equally filthy foot. We stare helplessly at each other. The carvings, almost a thousand years old and still vital, inscribed in the basalt rockface down which a little waterfall runs, are pretty special. “Excuse me,” bellows our very incensed hostess. “Your driver is right here!” Thom is snoozing in her hammock. I envy him. We fend off a man with some photocopied books, some small girls with bangles and a smattering of flautists. Then along comes a very persistent teenager brandishing what is really quite the largest t-shirt, in every dimension, that I have ever seen. Even High and Mighty might reject it as a tough sell. “It very hard today,” she says. “No tourists. I need money to eat.” Prudishly, I notice she is wearing lipstick and sparkly shoes. And then I notice the junkie darkness around her eyes. 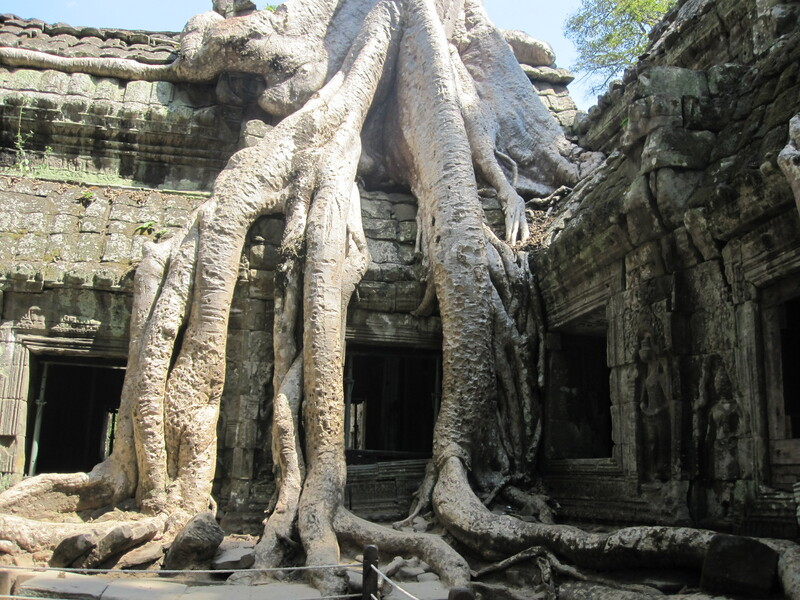 She has all the persistence of a London crackhead and it is a relief to be on the road to Ta Prohm. Ta Prohm is an enormous twelfth-century temple, surrounded by relatively manicured jungle, and locked in a titanic struggle with some almost equally gargantuan trees. Roots like dinosaur limbs clamber over tower roofs, younger saplings send tendrils down over delicate carvings. In places, it is hard to tell which is supporting which, the forest or the rock. Ta Prohm is also where the tour buses and minibuses go to greet the dawn. We step off the bike and into a storm of hawkers. I keep moving, chanting, “No thank you. I do not want to buy anything,” like a mantra, dragging Z in my wake. It is Cambodia writ very, very large. The grandeur of the Khmer kings, grinding poverty, good humour, and, in some of the children, the emotion kum, the slow-burning resentment which means that a neighbour might trim your tree inadvertently, only for you to knife him in the back, five years of polite pleasantries later. It is also, emotionally, quite hard to take. We stop on a causeway, surrounded by thick vines, opposite an orchestra of landmine victims, their artificial limbs propped casually against a tree, playing traditional music. The drummer seems particularly lost in his music. Then I realise his face seems especially unfocused because he does not have any eyes. Z finds a natural swing and sits in silence a few branches away from a little girl about his age, skiving either school or hawking, I cannot tell which. I am missing the solitude we achieved the day before, on the outskirts of Beng Mealea, where we found a half-dry river and sat in the shade watching dragonflies in lilac, turquoise, cerise, royal blue and scarlet chasing purple and orange butterflies through the green leaves. We troop along causeways, through ruined galleries, past mountains of faced blocks, past roots the height of a man, shellshocked by the scale. It would take weeks, if not months, to even begin to get a handle on these sites, a single temple as large as a walled medieval city, with an architecture, art and iconography that is all its own. The little girl is tiny and pretty. I would say he is heading into his teens and she is a year or two younger. The first shift of school is not over yet, so they will have been here since dawn. Teenage boys, even the well-nourished version we have in the West, need a lot of sleep, especially in the mornings. God only knows how he copes. We talk about school. What are they learning? “I learn read and write,” he says. But they know their capital cities. In prime position, front left of the food stall, a short, pudgy guy in his twenties in a hoodie is surveying all around, in particular the children. The boy goes over to him and a child’s toy appears on the table. He hands over his postcards. No money changes hands. He unleashes a broad and genuine grin. Z has oscillated between irritation and sympathy all day, and is avoiding anyone his own age on principle. As we embark for Angkor Wat, the icon of Khmer national pride, one of the wonders of the world, the behemoth which feeds a thousand hawkers, I ask Thom about the children. “Do they really go to school?” I ask. “Yes, yes, they go to school,” he says. He knows that I have seen his friend supplying them, but we leave it unspoken. “Some of it goes to the children, and they give some to the family too,” he says. I suppose I have doubted that these children go to school because I am patterning their desires and spending patterns on Western families. I am assuming that behind them is a family destroyed by addiction, parents spending on drugs and alcohol, kids spending on junk, and fizzy drink. Where school is a precious luxury and your only chance of escape from absolute poverty, children don’t skive off. “Is it better or worse than life in the countryside?” I ask. I think of the vast mass of brand new scooters, custom painted in fancy colours, that clog the playground of the USA International School in Battambang, the smart young mall rats in Phnom Penh, the candy-coloured wedding cake villas in provincial towns side by side with bamboo and corrugated iron shacks. The tone, which grated on me, was the whine of a rejected child. Which is, of course, exactly what she was, learning early and on a daily basis the lesson that life is easier for pretty girls. And, maybe, it really does make her cry. I did not say 10 dollars!!!!!!! I said about 50 cents, Not $10!! I’m loving the dispatches, they just seem to get better and better. You have a lovely knack (is it journalistic, or just writerly?) of being able to take the smallest thing and blow it up into a whole story. Quite wonderful. Maybe you should keep on going, do the series, travels with a 9/10/11/12/13/14 (gap here while he gets tired of mum for a while) 17/18 year old. I see a publishing phenomena. London forecast is heavy rain all this week btw. Really enjoy reading these dispatches. 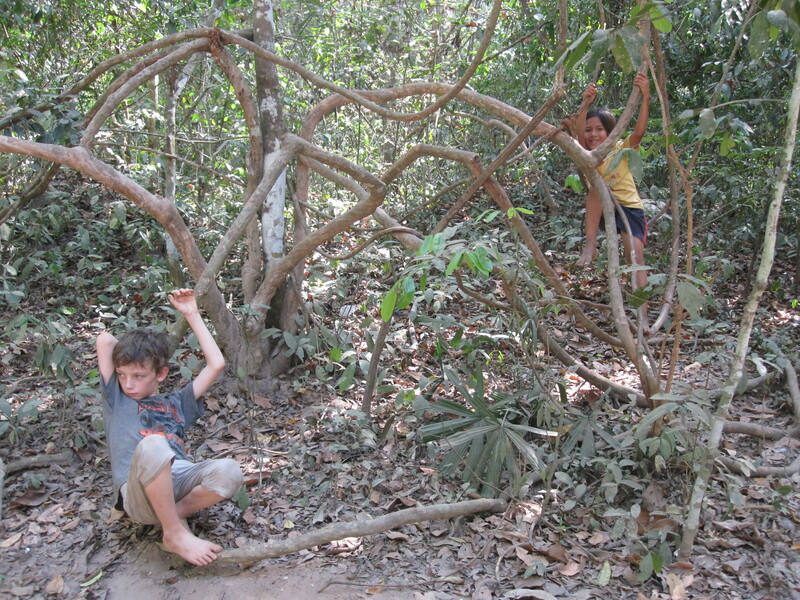 I returned from Cambodia in March 2010 and the story of the child sellers reflected by experiences. It is very sad. The kids have lost their childhood, at least as Westerners see it. Yes. I think there’s something particularly poignant about them working outside the home — if they were helping out on the land (of course, these families have none), it wouldn’t be so harsh — and the fact that it’s to rich Westerners on the tourist trade makes it particularly ambiguous… The particular prevalence of it in Cambodia may, now I think about it, have to do with the Khmer Rouge putting children as young as seven into work groups, making work outside the home part of real life for a generation.